If you have $499 to spare (after splashing out at least that much for your iPad already) then we have the stand / accessory for you. 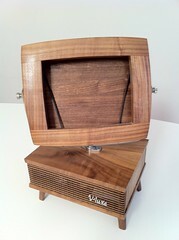 Evoking memories of classic 1950's TVs the V-luxe was created originally as a present for Paula Anne Patterson's partner. He loved it so much that they decided other people might enjoy the classic design and gorgeous materials used in its construction and we have to agree. Paula has set up her own workshop BKNYdesign and as a result of a successful Kickstarter funding project and since hitting her funding target, has been working on the production model of the V-luxe. The V-luxe features a 'clamshell' area which opens up so that you can slide your iPad in, forming the 'TV' part of the stand. The cabinet underneath has a grille which is actually a little door that opens up, revealing a shelf which can house Bluetooth or wired speakers that you can connect to your iPad. The pictures here really don't do the stand justice, but you can see much more of the stand and how cool it really is in the video on the Kickstarter project page (the Flash embed doesn't work here but the original does play on the iPad at the Kickstarter website). The final version will also feature cable management so that you can charge your iPad while it is in the stand. We love the fun TV Cabinet look of this stand along with the materials used in its construction and if we could spare $499 this would be very high on our wishlist. What do you think? Do you fancy getting one of these? Say hello to LJ! The household cat and also regular iPad stand of Veronica Belmont, the First Lady of Tech. Not the cheapest iPad stand we've come across but certainly the most comforting. Puuurfect! Remember that box of Lego bricks you traded for a couple of Star Wars figures? Yeah, turns out it was a bad idea. 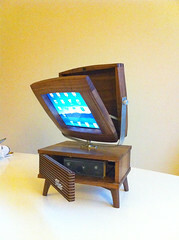 We quite fancy making an iPad stand out of a single block of driftwood. Any other ideas? Let us know in a comment below.